Rooms, Rental Cars or Airlines Tickets? 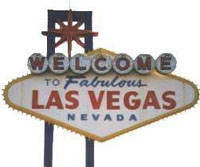 Welcome to the Insider Viewpoint of Las Vegas's Las Vegas Casino, Hotel, Motel Room and Rental Car Deal Web Pages. We are not a Travel Agency! You will deal directly with the Casinos, Hotels, Motels or Car Rental Companies. The prices do not have a surcharge or any hidden fees. We do not mark up the cost. This service is FREE to you! The Insider Viewpoint of Las Vegas is the #1 Informational Guide of Las Vegas, therefore we bring you another first for our readers. No longer do you have to surf the net looking up dozens of various Web sites to locate phone numbers, call for prices, availability and reservations. We have all the direct phone numbers and the most current quotes and availability listed all on one page. All we ask of you is to tell the company(s) you select that you received this information from the Insider Viewpoint of Las Vegas Web Site. By showing our advertisers and future advertisers we have loyal readers of the Insider Viewpoint of Las Vegas, they will continue advertising. Advertisers help fund the cost of making and maintaining this Web Site.